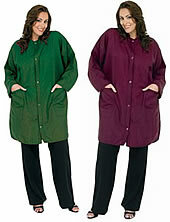 A Betty Dain Le Grande Big Shirt protects clothing while grooming dogs and cats, styling hair, applying makeup or working on fingernails. Constructed of a lightweight permanent crinkle nylon. Perfect for dog groomers, stylists, clients, nail techs, and estheticians.